You have already seen the array of JBoss BPM Suite demos based on the Alpha cartridge in OpenShift showcasing bpmPaaS in the Red Hat xPaaS story. Up to now you could play with the BPM product and work from the OpenShift Cloud instance just as if you were working locally. A showcase of this was provided for attendees of the online JBoss BPM Suite workshop hosted in London, South America and on the East Coast next month. What is a bit more interesting would be a preview of a JBoss BRMS application working on this bpmPaas, right? 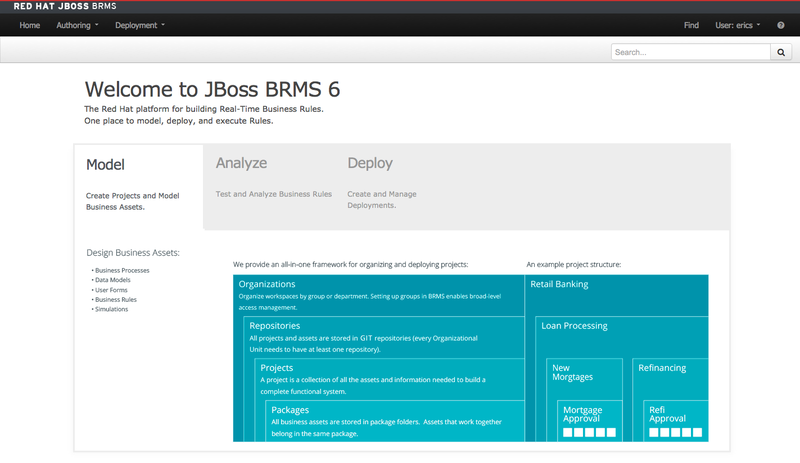 Well look no further, we have a preview demo project that you might already be familiar with, the JBoss BRMS Cool Store. With this publication we now have a cloud enabled JBoss BRMS available as an Alpha (unsupported) bpmPaaS solution to run this demo project. Here is a fully automated cartridge installation for JBoss BRMS Cool Store in the OpenShift Cloud that will allow you to kick start a pre-loaded demo project. First you need to have an account on OpenShift Origin, which you then can upgrade for free to the Bronze level (no monthly fee, just usage fee, see details). This gives you access to the creation of LARGE sized gears which you will need for any bpmPaaS BRMS instances you create. This is a field where you can paste in the cartridge definitions we provide in the bpmPaaS Cool Store project. Just follow the project readme file instructions and you will be up and running a full bpmPaaS based on JBoss BRMS in a matter of minutes.